The Agricultural Producers Association disagrees with the Canadian Pacific Railway’s decision to close at least 10 producer car loading sites in Saskatchewan, including one at Moosomin, and is asking for a federal moratorium. In a letter to Federal Transport Minister Marc Garneau, APAS is requesting a moratorium on the closure of producer car loading sites until a full review of railway costs is completed. The letter also requests legislative changes to ensure that the closure of urban and rural sidings are subject to the same requirements. “Producer car loading is an important source of competition and innovation in Saskatchewan’s agriculture industry,” said APAS President Todd Lewis. Lewis also pointed out that once a loading site is listed for discontinuance, it is extremely difficult to have the site re-listed for service at a later date. Grain producers have a legislative right to order rail cars through the Canadian Grain Commission under the Canada Grains Act. This is to ensure that producers have meaningful access to market their grains using Canada’s rail network. However, in the last decade, Canadian railways have been closing public loading sites at an accelerated rate. If these closures proceed, the number of loading sites on CP rail lines in Saskatchewan will be reduced to 26, down from 79 in 2005. Although the number of sidings have decreased dramatically over the years, the railways are currently compensated for maintaining the same number of sidings that existed in 1992. “The Maximum Revenue Entitlement program’s formula is clearly out of date,” Lewis said. Under the Canada Transportation Act, railways can close a loading site after 60 days of publicizing the notice in a local newspaper. APAS is also asking that that time frame is extended to give municipalities and affected producers more notice and ensure they are adequately consulted. Lewis said APAS found out about the closures after CP placed a notice in the World-Spectator to announce the Moosomin closure. Sinc Harrison read it and contacted APAS. While federal legislation requires railways to notify the public in the case of a closure, there is no requirement for consultation once notice has been given. Lewis said farmers will still be paying the cost of maintaining the sites through freight rates once they are closed. Lewis said he’s hoping the federal government will step in and stop any closures at this point. CN is not planning any closures. CP plans to close 10 sites in Saskatchewan, six in Alberta, and two in Manitoba—18 sites altogether. According to CP, the closures will allow the railway to provide better service, but Lewis doesn’t buy that. “CP is saying it is about service and everything else. Well that is part of the issue—the rail system has been so unpredictable. A perfect example—if you had ordered a producer car from CP there were lots of weeks last winter that you had a 50-60 per cent chance at best of receiving it. Lewis said APAS had not met with CP on the issue. Lewis questions the timing of CP’s announcement. Lewis believes there is a future for producer cars as the marketing systems for agricultural products change. 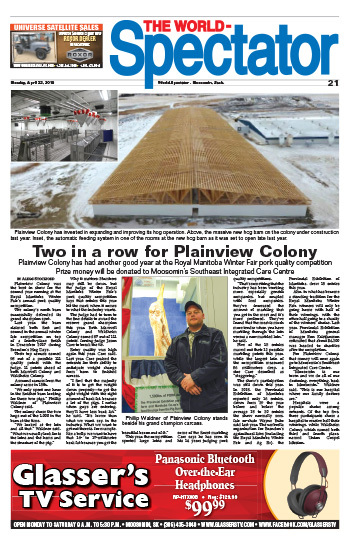 “As the grain industry evolves, there are lots of smaller players that want to buy producers’ product and get it into export position,” he said. “Some of those players are looking directly at producer cars to ship their product to the coast. The Moosomin siding was used to ship 60 producer cars in the 2014-2015 shipping season, and none in the 2015-2016 season. “That is pretty significant, especially for those producers that used them,” said Lewis. “That could be the majority of their crops, depending on the size of the farm. 60 cars out of Moosomin is pretty significant. “Producer cars are entrenched in legislation and should be made available. The producer car system provides good balance because if you have wide swings, crazy swings in basis, if the basis get too high you can order a producer car, which saves you quite a bit of money and makes it more worth your while. “If there are other means of moving your crop through an elevator system or if a company is taking too much off the top and you think can do it better, you can load it yourself with the producer cars. It just adds balance. The availability is pretty important. APAS has not yet heard back from the federal government. He said he is hopeful the federal government will listen to APAS’s concerns. Lewis thinks the federal government would be wise to issue a moratorium so the sidings aren’t closed before producers have a say and before new legislation comes into effect. “I think it is the minister’s call,” he said. “It is a short time frame. The minister has to make a quick decision and that’s what we expect. A moratorium can be a set amount of time—it doesn’t have to be an open moratorium. APAS is asking its members to lobby the government on the moratorium. Sinc Harrison is a retired Moosomin-area farmer who served for years as reeve of the RM of Moosomin, and as president of the Saskatchewan Association of Rural Municipalities. 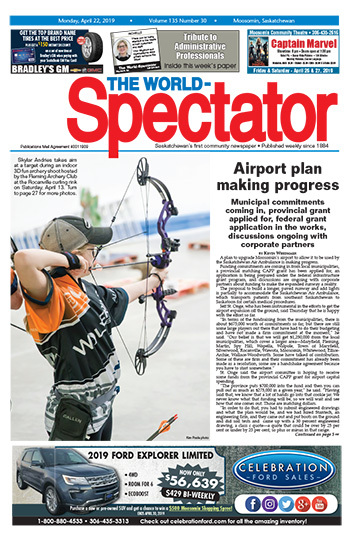 After he saw the notice from CP in the World-Spectator, he notified both APAS and SARM, which is how they found out about the planned closures. He said the low usage of producer cars is not indicative of a lack of need. “The reason they were put in there decades ago was if the elevator system is not working or in the eyes of the producer, they can go directly into the producer car. So the fact that they are not being used right now is not a good indicator of whether they are required or not. Just by being there as an option, they’re doing what they were intended. “If this site is discontinued, the closest one I understand talking with one of the commissioners at the grain commission is Virden. “That means that somebody would have to haul their auger to Virden, and haul their grain to Virden, which is costly and leads to more road repairs and all that. He said he believes the Moosomin producer car site is important. “It has been used in the past and I think it is very important it be maintained in the future,” Harrison said. He said the timing of the announcement couldn’t be worse for producers. “I think in the eyes of a producer, they announced this just before harvest when the producers are busy which means producers probably have other things on their mind than producer car sites. Harrison believes the call for a moratorium is the right move. “Any delaying tactic is good,” he said. “If that means they are not titled to remove them in the future, that would be a good thing. If they do choose to take this producer car loading out I can’t imagine what you would have to go through to get it reinstated.